This antique style three stone Martin Flyer engagement ring features two round brilliant cut side stones and hand engraved scroll work on the band. 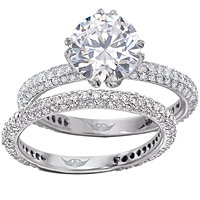 This ring was designed to perfectly show off your choice of a center diamond. All FlyerFit rings are made to fit perfectly flush with almost any wedding band. Available in platinum, 18kt white gold or 18kt yellow gold and can accommodate a round brilliant from .50ct to 4.20ct. This stylish three stone Martin Flyer engagement ring features two princess shaped side diamonds and round brilliant cut pave-set diamonds going 1/2 way around the band. The matching Martin Flyer wedding band features round brilliant cut pave-set diamonds having a total weight of .30ct also going 1/2 way around the band. The band measures 2.1mm wide and is a perfect match for this engagement ring setting. All FlyerFit rings are made to fit perfectly flush with almost any wedding band. This stylish Martin Flyer engagement ring features channel-set asscher cut side diamonds going 3/4 the way around the band and beautiful hand engraved scroll work giving the ring a vintage look. Available in Platinum, 18kt White Gold or 18kt Yellow Gold and can accommodate a round brilliant or fancy shape center stone from .50ct to 5.20ct. This beautiful Martin Flyer engagement ring features 12 channel set graduated round brilliant cut side diamonds and hand engraved scrolling finished off with milgrain edges. All FlyerFit rings are made to fit perfectly flush with almost any wedding band. Available in Platinum, 18kt White Gold or 18kt Yellow Gold and can accommodate a round brilliant or fancy shape center stone from .40ct to 6.20ct. This stylish Martin Flyer engagement ring features small round brilliant pave-set diamonds going half way around the band. Available in Platinum, 18kt White Gold or 18kt Yellow Gold and can accommodate a round brilliant or fancy shape center stone from .50ct to 6.20ct. Matching wedding band sold separately. All FlyerFit rings are made to fit flush with almost any wedding band. This classic three stone Martin Flyer engagement ring features two round brilliant cut side diamonds designed to enhance the center stone. FlyerFit rings are made to fit perfectly flush with almost any wedding band. 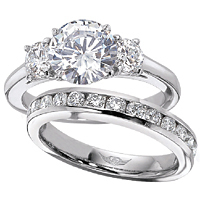 Available in Platinum, 18kt White Gold or 18kt Yellow Gold and can accommodate a round brilliant from .80ct to 4.20ct. This stunning Martin Flyer engagement ring 5188E features small round brilliant cut side diamonds which are pave-set and go 4/5 of the way around the band. All FlyerFit rings are made to fit perfectly flush with almost any wedding band. Available in Platinum, 18kt White Gold or 18kt Yellow Gold and can accommodate a round brilliant or fancy shape center stone from .70ct to 6.20ct. This stylish Martin Flyer engagement ring features a pear shape side diamond set on either side of the center stone and small round pave-set accent diamonds on the band. Available in Platinum, 18kt White Gold, or 18kt Yellow Gold and can accommodate a round brilliant or fancy shape center stone from .70ct to 6.20ct. This stylish Martin Flyer engagement ring features two tapered baguette side stones with pave-set round brilliant cut diamonds on the shank. Available in Platinum, 18kt White Gold or 18kt Yellow Gold and can accommodate a round brilliant or fancy shape diamond from .50ct to 4.20ct. This classic Martin Flyer engagement ring #MF 5137SOLPL-AENG features beautiful hand engraved scroll work and will show off your center stone perfectly.